Do you enjoy your cup of coffee in the morning? Indeed, coffee became a morning habit for a lot of us. But it did not only become a part of our morning ritual but also became a part of our social life. For example, a lot of business lunches are happening at the coffee shop. Or where do you usually meet with your friends? Now when it comes to the Paleo Diet principles, coffee is one of the foods that got controversial reviews among the Paleo Diet followers. 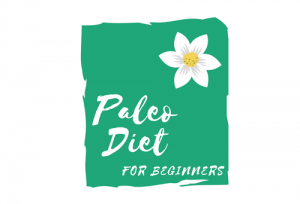 The Paleo Diet and coffee consider to be in line with the Paleo Diet principles by ones and goes against the Paleo Diet principles by others. To find the truth we should not only look at the origin of coffee, its benefits, and negative side effects but also review what the founder of the Paleo Diet says. You probably know that coffee is grown on the coffee tree. And the coffee beans are actually the processed and roasted seeds from a fruit, which is called a coffee cherry. The coffee trees are usually very short (maximum 30 feet – 9 meters). The coffee tree is usually covered with the green and waxy leaves, flowers, green fruit and ripe fruit at the same time. Surprisingly but it takes a full year for a coffee cherry to mature after first flowering and approximately 5 years to become a fruit that can be used. Did you know that the coffee trees can live up to 100 years! Though they provide with the harvest during their first 7-20 years. Commercially grown coffee is getting cultivated in a region called the Coffee belt (1). The trees need to have rich soil with mild temperatures, frequent rain, and shaded sun. These are quite specific conditions for the coffee trees to be grown. In commercial coffee industry, there are two main coffee types – Arabica and Robusta. Coffee Arabica is one of the most known coffee trees that represents about 70% of the world’s coffee production. The beans are flatter, longer and contain less caffeine compared with the Robusta. Arabica coffee trees need a specific environment to grow and for the most part, the ideal terrain for these trees is steep and access to it is difficult. The trees are less resistant to disease and parasites, therefore, require more job to be done. Robusta coffee represents only 30% of the world’s coffee market. Robusta’s coffee beans are rounder, smaller and contain 50-60% more caffeine compared with Arabica coffee beans. The trees can withstand warmer temperatures and are naturally more resistant to disease and parasites. Therefore, it is generally cheaper to cultivate Robusta trees. A lot of us reach out for a cup of coffee to energize ourselves. Indeed studies show that coffee can actually increase energy level and make you feel less tired (2). One of the component of coffee that makes us feel more energetic is stimulant called caffeine. Caffeine has the ability to block an inhibitory neurotransmitter in the brain that leads to a stimulant effect. Studies show that may improve various brain function such as memory, mood, energy level, reaction time and general cognitive function (3, 4). Caffeine that is one of the main components of coffee was proven to aid fat burning. Several studies show that caffeine may boost your metabolism by 3-11%%! (5, 6). Caffeine not only stimulates our nervous system and sends signals to the fat cells to break down fat but also increase Adrenaline levels in the blood (7). Caffeine makes the fat cells break down body fat and using released into blood free fatty acids as a fuel (8). Coffee is much more than just a drink we need to have in the morning. The numbers do not look bad for a single drink! It is proven that coffee has an enormous amount of antioxidants. Moreover, studies show that most people get more antioxidants from coffee than both fruits and vegetables (10). Why Coffee May Not Be Good For You? If you drink coffee very often you probably found yourself in a situation when you have a hard time falling asleep after taking a cup of coffee in the afternoon. The half-life of caffeine is 6 hours. Therefore, it takes 6 hours for our body to eliminate half of the coffee effect. The rule of thumb is to avoid drinking coffee after around 2 pm. The studies show that drinking coffee later in the day is strongly associated with insomnia, which in its turn may cause other health issues (11). Basically, any drink containing caffeine can be blamed on that. However, it is coffee that we used to drink every day and start our days with. Caffeine provides with two types of boost: immediate and long-term. The long-term boost is a concern because it stays in our body as long as caffeine remains in our system. And it is, even more, a concern for people who drink coffee throughout the day. The studies show that caffeine may decrease GABA levels, the transmitter that helps to regulate anxiety (12). Therefore people with the anxiety condition should avoid drinking coffee. Studies showed that caffeine may change our taste buds and make sweet things taste less sweet (13). This finding may offset the benefit of fat burning process that the coffee may offer. The finding also explains why coffee goes so good with sweet pastry like doughnuts. Coffee stimulates the secretion of gastric acid that can cause heartburn even if do not suffer from it very often. It may make the situation much worse if you have Gastroesophageal Reflux Disease (GERD). We already know that caffeine is a powerful stimulate. It stimulates the central nervous system and tends to ward off drowsiness. A lot of dependent on coffee people reported that coffee does not give them the same amount of boost as it used to be when they started drinking coffee. When it comes to the Paleo Diet a lot of different authors have contradicting views. Keep on keeping on (with an occasional detox to clean things out). “Coffee should be excluded by anyone seeks to achieve the most out of their Paleo lifestyle. 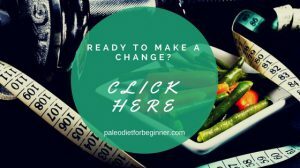 The Paleo Diet focuses on eating nutrient dense, naturally occurring, anti-inflammatory foods that promote overall wellness and sustained levels of energy. Many people who switch to the Paleo Diet discover that their morning cup of black gold becomes a habit of the past. 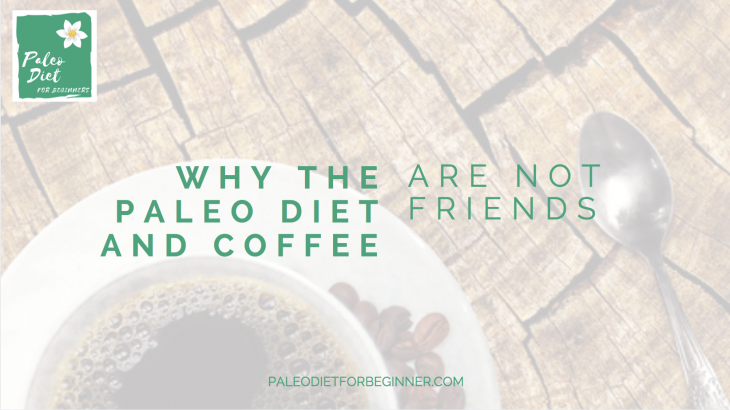 So answering the question if coffee is Paleo, the answer is – not, coffee is not Paleo. As you can see coffee has its positive and negative effects. Coffee may offer a lot of health benefits but recent studies also show some concerns about its regular use. Even though some authors point out that coffee is the Paleo Diet-friendly drink. It is actually not. The creator of the Paleo Diet believes that coffee should be excluded from the diet as the Paleo Diet focuses on eating nutrient dense, naturally occurring, anti-inflammatory foods that promote overall wellness and sustained levels of energy. If coffee is something that you cannot imagine your morning, you might want to consider following the Primal diet principles, where coffee plays an important role. 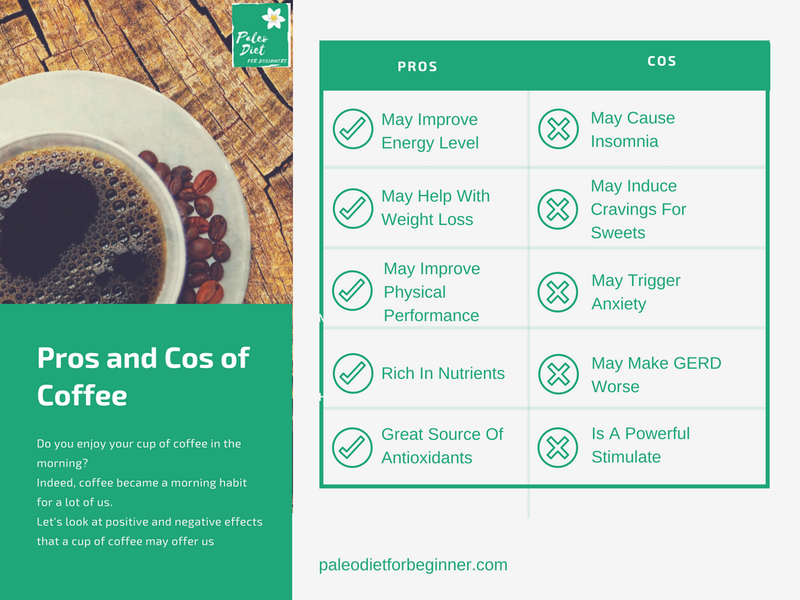 Nutrition Facts benefits of coffee, is coffee paleo?, negative effects of coffee, paleo diet and coffee, pros and cos of coffee, what is coffee. permalink. This article shows that coffee has both positive and negative effects. And in order to do away with it and to replacing our morning of cup, paleo diets come into play. This a very useful information which is also a new trend. I encourage every reader to switch on to paleo diet as it comes with dense nutrients. Thanks for sharing this information and I wish all the best of success to this newly founded niche. Coffee is one of the drinks that a lot of people have a hard time to give up. And sometimes it is just a habit. A habit to have a cup of coffee in the morning, a habit to go with friends or colleagues for a cup of coffee. Definitely coffee provides with a lot of benefits that a lot of articles mention about. But not a lot of articles share also the negative side effects of this powerful drink. Moreover, within the Paleo Diet followers, you could find different opinions. regarding coffee. Therefore I wanted to find out whether it is actually Paleo Diet-friendly, which it is not. I’ve learnt so much from your post. It is very easy to understand for a person with 0 knowledge about paleo diet and it got me hook in wanting to know more. I am happy that you found a lot of value in this post and on the website as well. If there is anything else I could do for you, please do not hesitate to contact me.